If you are a prospective PhD student interested in theory/algorithms, please apply to the Duke Computer Science PhD program and send me a short note. For more details of our theory group, please check out our theory wiki. If you are a current Duke undergraduate student and want to do research in theory/algorithms, please send me an email with your interests and background (e.g., performance in relevant courses). I am part of the Indo-US Virtual Networked Joint Center on Algorithms under Uncertainty. Papers by year and by topic. 25th European Symposium on Algorithms (ESA), 2018. 19th ACM Conference on Economics and Computation (EC), 2018. 19th International Workshop on Approximation Algorithms for Combinatorial Optimization Problems (APPROX), 2016. 47th ACM Symposium on Theory of Computing (STOC), 2016. 35th Foundations of Software Technology and Theoretical Computer Science Conference (FSTTCS), 2015. 1st Conference on Topics in Theoretical Computer Science (TTCS), 2015. 26th ACM-SIAM Symposium on Discrete Algorithms (SODA), 2015. 17th International Workshop on Approximation Algorithms for Combinatorial Optimization Problems (APPROX), 2014. 11th Workshop on Approximation and Online Algorithms (WAOA), 2013. Assistant Professor, Department of Computer Science, Duke University, Durham, NC, 2013---current. 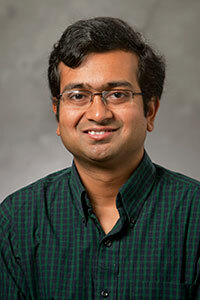 Postdoc, Theory Group, Microsoft Research, Redmond, WA, 2012---2013. PhD in Computer Science (Advisor: Prof. David Karger), Theory Group, CSAIL, MIT, Cambridge, MA, 2007---2012. Member of Technical Staff - 1, Bell Labs, Bangalore, 2006---2007. ME in Computer Science (Advisor: Prof. Ramesh Hariharan), CSA, IISc, Bangalore, 2004---2006. BE in Computer Science and Engineering, Jadavpur University, Kolkata, 2000---2004.